Now that’s a beautiful wine shop! We decided we’d had enough driving for awhile, so we did Sicily by train. We were hesitant about dragging bags from place to place and making connections, and it did limit us to just a few towns, but it worked out really well for us. We flew into Palermo and then took the train to Agrigento. The Valley of the Temples is such a fantastic experience, it was worth doing even though it was nearly a full day’s travel to get to our next destination. Eight Greek temples of the ancient world remain there, some incredibly well-preserved, going back as far as the 6th century BC. There is something so powerful about contemplating the many civilizations that have made the island of Sicily their home. Next day, we had a long trip to Syracusa. We knew there would be a three-hour layover in Catania, making the trip take the better part of a day. But the good news was that the train station is quite central in Catania, so we could check our bags at the station and walk to the Piazza del Duomo, visit the Church dedicated to St. Agatha, and have a nice lunch of pizza and salad before heading back to the station. We asked someone directions and he gave us very clear instructions: “Continue on this street until you run into the elephant.” It sounds even better in Italian. He was talking about the Fontana dell’Elefante, featuring an elephant, symbol of the city, carved from black lava from Mt. Etna, in the beautifully-designed Piazza. This little excursion was something we could never have done in an airport layover. I must also note that every single person we spoke to in Sicily, from taxi drivers to strangers on the street, were helpful and welcoming, kind and friendly. We arrived in Syracusa and settled in for the night. In the morning, we visited the Parco Archeologico della Neapolis, with its Teatro Greco amphitheater, where Euripides’ plays were mounted and Archimedes is said to be buried. We also had to see the celebrated “ear of Dyonisus,” the cave with ear-shattering acoustics. And, yes, I did sing. I sounded amazing, I thought, until an English choral group entered the cave and did a well-rehearsed dirge. THEY sounded amazing. On Ortygia Island, the old city of Syracusa has been inhabited for two thousand years. The Piazza del Duomo was lovely, dominated by the cathedral incorporating architectural fragments from a 5th Century BC temple to Athena, with 26 of the original columns still in place, and the cathedral built over it. This cathedral honors patron Saint Lucia. St. Lucy is a very important Christian martyr, and we also have special feelings for Lucy because that is our granddaughterwe ’s name! We also visited the Palazzo Bellomo museum, a 13th-century palace with a very good collection of paintings from the Middle Ages and Renaissance. After that, we took a walk all around the Island of Ortygia. It took longer than expected and went through a couple of sketchy areas, although the sea views were quite beautiful. But I wouldn’t recommend doing it again. The next day, we were ready to chill relax in Taormina. More about that in the next post, including the explosions on Mt. Etna! Please click on a thumbnail and look through our pictures of Sicily, part one. This entry was posted in Uncategorized and tagged adventure, Agrigento, Budget Travel, Burial of St. Lucy, Caravaggio, Catania, Mt. Etna, Sicilia, Sicily, Siracusa, Syracuse, Taormina, travel, Valley of the Temples on November 1, 2013 by ayoelkers. 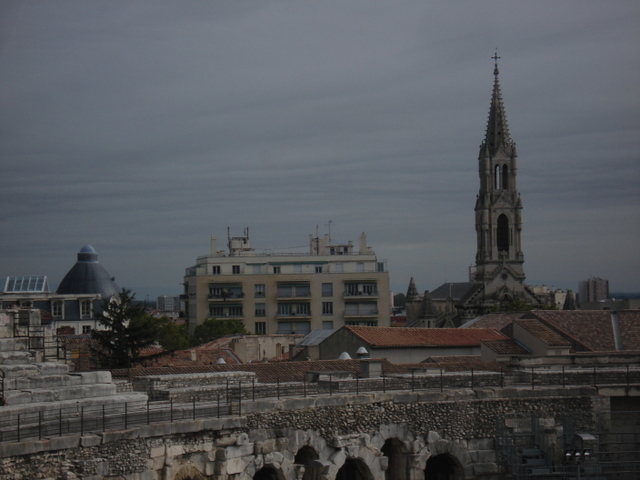 We couldn’t leave the Arles area without a quick stop in Nîmes. Yes, another Roman arena—but this one is probably the best preserved Roman Arena in the world, with 24,000 seats and 60 arches. There is also a temple, the Maison Carrée, surviving almost intact from the Roman Empire, smack in the middle of the city, dating to 4 BC. Pretty amazing. 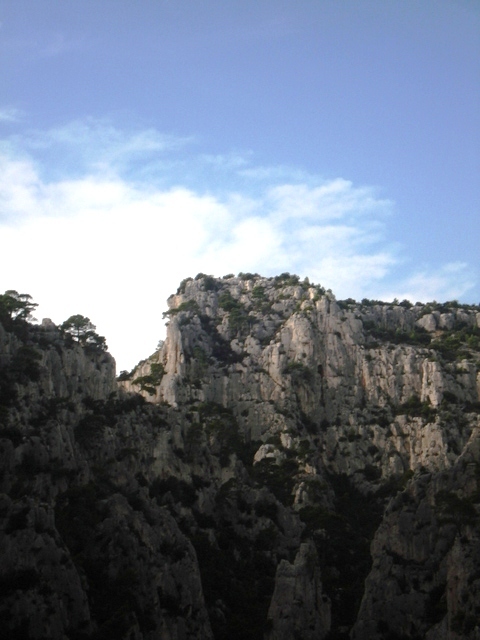 After that, we drove south to Marseilles. We had a bit of a problem finding our apartment in this big bustling city. Then, when we finally found it we were sorry we did. It was a garret straight out of La Boheme, a seedy seven-story walk-up with some maintenance issues. We complained, the owner got us moved into a better place (not a GREAT place, but better) a few blocks away (this one only six stories up!) 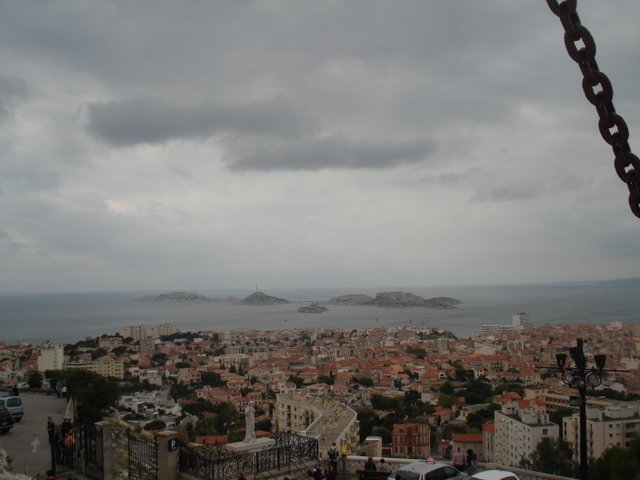 and the rest of our time in Marseilles was great. It was the first place in all of our bargain-basement lodgings that was not acceptable. Considering all the moving around we’ve done, one bad experience is not so tragic. 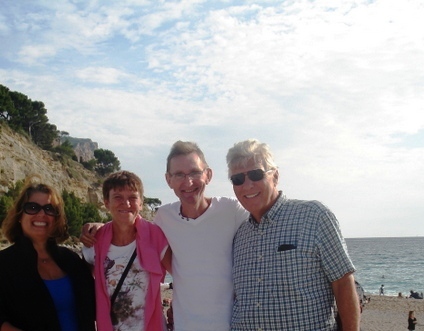 We were so very happy that Ray’s old chum John from the UK decided to meet us in Marseilles for the weekend. It had been several years since they’d seen each other, and though I’d met John when he was in New York, we had not known each other as couples. As expected, Julie is as fun-loving and sweet as John. J & J stayed in the Sofitel near the old port—much more elegant digs than we had, to be sure! Good thing, or they’d never have agreed to travel with us again! Nevertheless, they stopped by our ‘hovel’ to share in the lovely wines we brought back from the Cote du Rhone wine tastings earlier that week. Incredible vintage Gigondas in water glasses, sitting on Ikea bar stools in a 6-floor walk up. Definitely a contract between beverage and setting. It was such fun just to be with them. We couldn’t have had a better time, and I know that it won’t be several MORE years until we get together again. Ray and I were both so touched that John and Julie took this trip just to spend some time with us—that’s real friendship! 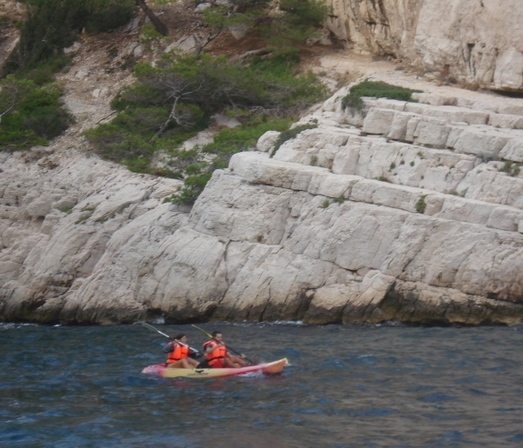 Beside enjoying some wonderful seafood dinners and way too much wine in Marseilles, we took a drive together to Cassis to see the port and the amazing Mediterranean fjords—the Calanques. The little port town of Cassis is post-card pretty, with castle ruins, fortress walls, sunny beaches, and a charming port with sport, tour, and fishing boats—and the occasional uber-luxury yacht. Ray has really enjoyed driving the winding and scenic routes all through our travels, and he has been a great navigator and adventurous wanderer throughout. But nothing compares with La Route des Crêtes. This winding road up to the top of Cap Caneille (the largest of the cliffs with a 1200 foot drop straight down) and then on to the next town, La Ciotat. The views were worth the white knuckles! 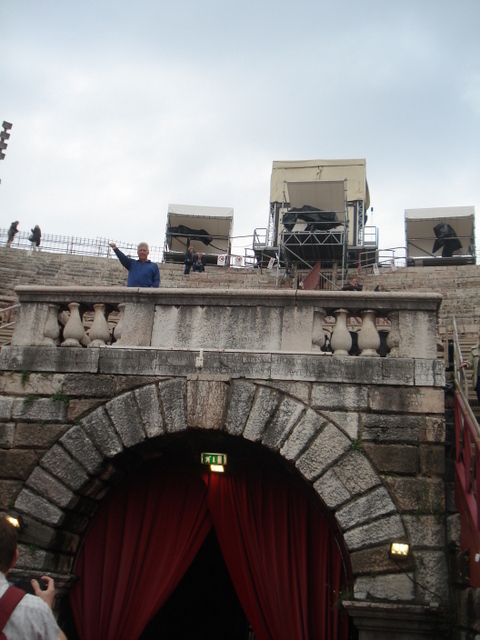 Then back to Marseilles for some well-deserved wine and another great dinner. 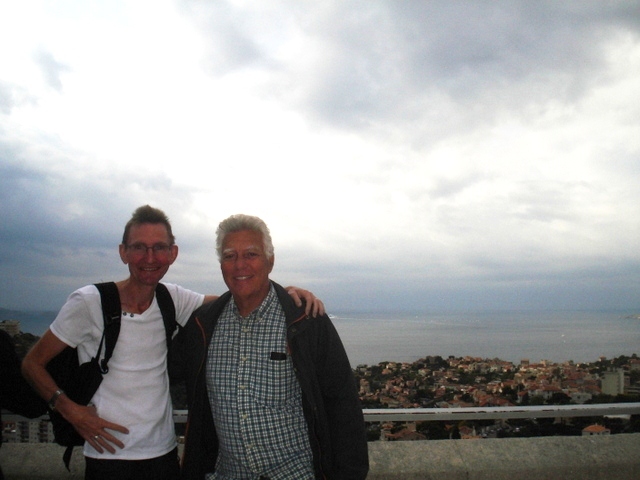 Next morning, we took the “petit train” –the little tourist put-put—from the old port up and up through the narrow streets to the Basilica de Notre Dame de la Garde overlooking the city. Another high point—literally and figuratively. Magnifique! 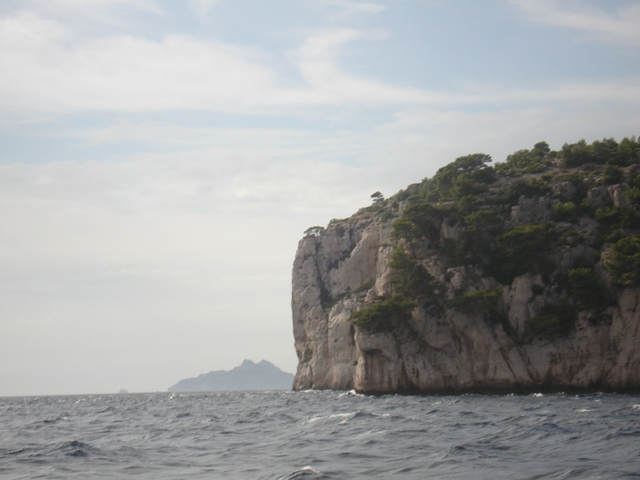 This entry was posted in Uncategorized and tagged Calanques, Cassis, France, marseilles, Nimes, travel on October 30, 2013 by ayoelkers. This is late October–and it’s bikini weather! Those little dots are flamingos–need a better zoom! After driving up into the mountains of Provence, the open flat lands of the Camargue were quite a contrast. This marvelous area contains everything from rice fields to ranches for the bulls raised here for both bull games and the ubiquitous taureau dishes served in every restaurant. The Camargue is also known for the salt flats, from which a terrific culinary product is produced and sold throughout France. (We learned to use it sparingly, as the flavor is really intense compared with regular sea salt.) The small light grey or white wild horses also inhabit the Camargues, and are said to be one of the oldest known breeds. The drive through this area was so scenic and the terrain and plant life so varied, we felt as if we’d driven to another country. 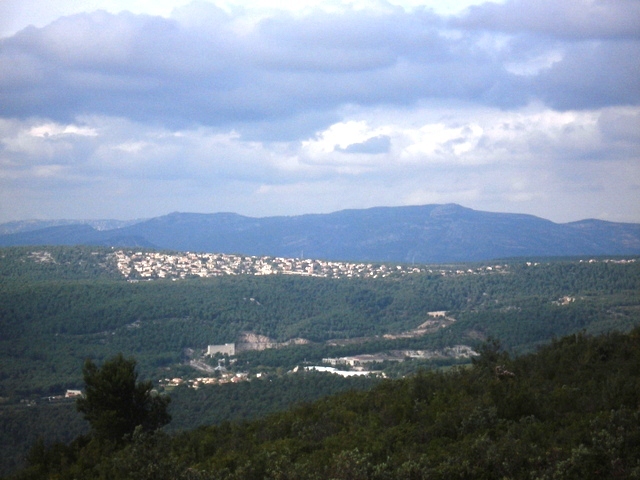 But it’s just another side of wonderful Provence. At La Capelìere we walked the nature trail and enjoyed the shelters built at various points where we were able to stay hidden while using the high-powered binoculars to spot ducks, grey herons, and hundreds of flamingos. Apparently, the flamingos summer here, but some of them enjoy Provence so much that about one fourth have now taken up permanent residence, and no longer migrate. I can understand that inclination. We didn’t see any of the wild boars that roam this area, but we enjoyed walking through the preserve at on a short hike that included different environments: forest, wetlands, salt marsh, and lagoon. We had a perfect day for this excursion, warm and sunny but not too hot. By October, the mosquitoes were no longer a problem, and we stayed to enjoy another of those great picnics with wine we had bought on our Cote du Rhone tour the previous day, along with wonderful cheeses and bread we bought in the small bakeries and cheese shops in the town of Arles that morning. As we were heading away from the marshes to visit Stes-Maries-de-la-Mer, the little beach community on the west ernend of the Camargue, I mentioned to Ray that we hadn’t seen any wild horses. Then we rounded a curve in the road and there they were—lots of them. We were able to get very close–they were not the least bit people shy. Gorgeous creatures. Stes-Maries-de-la-Mer was a quirky little beach resort with kind of a counter-culture vibe—probably because it is a mecca for the Roma community. (a.k.a. gypsies) It reminded us a little of some New England seaside communities. Definitely not the French Riviera crowd at this resort. We were so lucky to have this mild fall weather, when the beaches are still warm enough to enjoy in mid-to-late October. We are so lucky for a lot of reasons!!! This entry was posted in Uncategorized and tagged Arles, Carmargue, France, Provence, The Camargue, travel on October 29, 2013 by ayoelkers. Olive trees at St. Remy–do you recognize the scene from Vincent’s work? 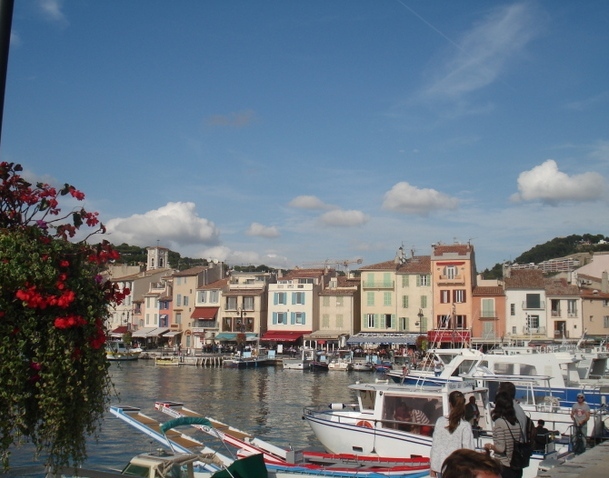 We enjoyed the many sides of Provence…the ancient cities, the Rhone River and Valley, the Apilles, foothills of the Alps, the flatlands and salt marshes, the Wine Country, the bustling port of Marseilles…so many different experiences in a small area and a short period of time. 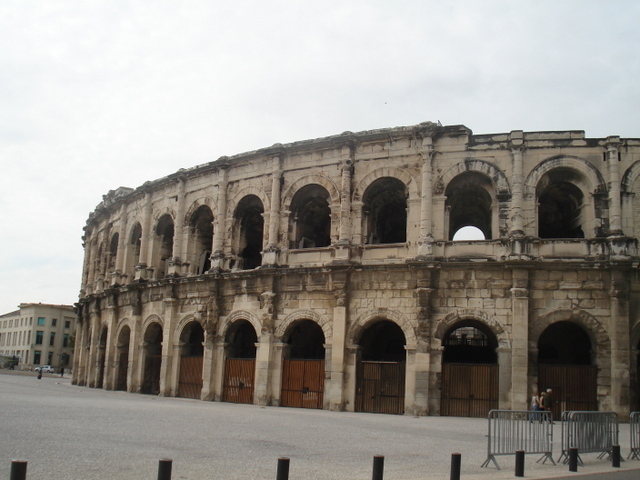 This post is about Arles, Les Baux, St Remy, and the Rhone wine country. There will be more about the Camargue later. The first day we just enjoyed exploring Arles. The church of St. Triomphe and the cool and slightly creepy Criptoportiques –the Roman arches underneath the Forum–reminded us of the long and diverse history in this part of the world. At the church, after enjoying the very special Romanesque arched entrance depicting stories and lessons from both Christian and Hebrew bibles and classical mythology, we visited the cloisters, where we ran into a few hikers stopping here along the pilgrimage to Santiago de Compostela and wished them “Buen Camino.” Then on to the classical theatre and the Roman Arena, dating back to the 1st Century BC. After a terrific dinner of Soupe de Poisson, which was just what I needed to treat the terrible cold I was battling (no worries, I won the battle, gladiator that I am). 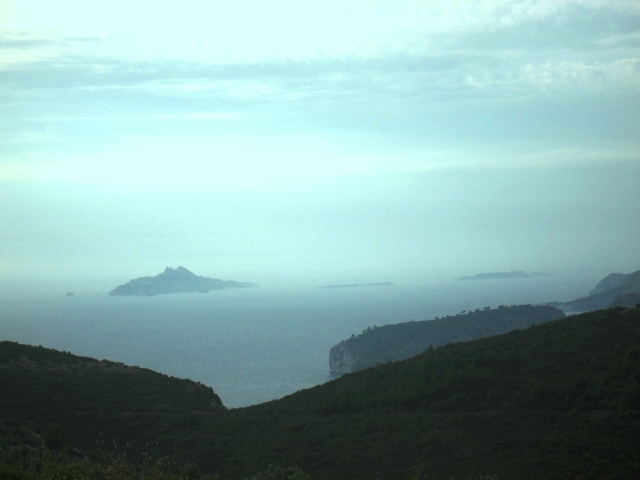 We went to bed early planning to visit Les Baux and St. Remy the next day. The midievil town of Les Baux was really special—I hope the photos give you some idea of the drama of this setting. The castle ruins, high up on the hill, overlook the incredibly green and fertile Rhone Valley. Very beautiful. ­And another excuse to climb up to a high spot for pictures and bragging rights! After a special lunch of Provencal lamb and ratatouille back in the village (it’s said the flavor is so good because the lamb is seasoned “on the hoof” as the sheep graze on herbs and lavender, and eat grasses from the salt marshes). On the way out, we stopped at the Carriere des Lumieres—a cave just outside Les Baux with projected images of artworks on the quarry walls. It was, um, interesting. Ray described it as “trippy.” I think that’s the perfect word. If you missed the 60’s, this attraction may give you a little taste of what it was like. Then, we continued on to St. Remy. The drive was quite lovely, with great long stretches of road bordered on both sides by plane trees, just starting to show their golden fall colors. After walking in Vincent Van Gogh’s footsteps in Arles, we thought St. Remy might feel a bit redundant. But visiting the Monastery of St. Paul and the mental hospital where he was treated in St. Rémy, where he completed over 140 paintings and 100 drawings in just a year (1889-1890) was very special. The setting is peaceful and serene. It was moving to walk in the same gardens and groves that soothed and inspired the tormented genius. It’s easy to believe that he was happiest here, with nothing but his art, quiet gardens and the ever-changing Provencal landscape to sooth the soul. I can’t wait to try some paintings and pastels inspired by the photos I took here. Homage to a beloved artist. 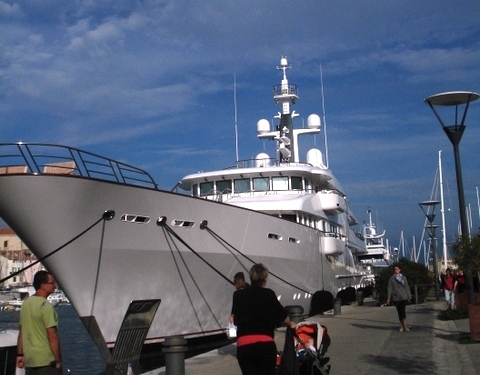 The next day was the vineyard and wine tasting tour. I will let Ray tell you more about the wines, but will post a couple of photos here. The Cotes de Rhone area has some breathtakingly beautiful scenery, and we were so glad that the sun came out for us right after noon. The vineyard Domaine Coyeaux is located in one of the most picturesque spots I have ever been. If the wine wasn’t good, I wouldn’t have cared, really. But it was really very good, and we tasted and bought a Baume de Venise there to enjoy later with our friends in Marseilles. Even if you are not a wine aficionado, anyone would enjoy the scenic drive through the mountains, across the Col de la Chaine mountain pass, circling the Dentelles de Montmirail peaks on a sunny autumn day. After returning to Arles, we had a special dinner prepared by the well-known chef Jean-Luc Rabanel at A Côté. We thought his restaurants would be too pricey, but the chef has now consolidated his higher-end and casual restaurant’s menus for mid-week and off-season tourism, so it was very affordable. The weather was warm enough, with the help of propane heaters, to enjoy our meal outside on the quaint stone-paved patio in the fragrant night air. I had pissaladeire and brandade, traditional Provencal peasant food. There, we planned our next move, which was to visit the Camargue delta of the Rhone, where rice fields, salt marshes, and a Regional Nature Park right outside of Arles offer a gorgeous landscape and wildlife experience away from the cities. More to come about that. Meanwhile, click on the thumbnails above to enlarge and toggle through our photos from Arles and the Rhone Valley. This entry was posted in Uncategorized on October 26, 2013 by ayoelkers. Padua was so much more than we expected—and we expected a lot. We stayed in a wonderful little B&B with a gorgeous dramatic room and bath with 10 foot ceilings and a charming host named Mario. Little B&B’s are popping up all over Italy since the category was created in 2000. It’s a great alternative to hotels, and we’ve had nothing but good luck in the last three places in Italy where we’ve opted to go this way. It’s like having a friend who lives in town. If you’re careful about checking the location and feedback online, it’s a great way to go, and saves a fortune over hotels. We were more lucky than clever in Padua. We arrived in the afternoon and took the tram to our place, then wandered into the old city to see what we could see. I thought we should go to the Basilica of St. Anthony first, since it stayed open until 7:30 and was one of the major reasons for visiting there. This was a twofold pilgrimage—for art and for the spirit. St. Anthony was the saint to whom my grandmother prayed for many things. Whenever we lost something, she would tell us to pray to St. Anthony. When I was trying to have a baby, she prayed to St. Anthony for me. Visiting the basilica was a chance to see one of the most visited pilgrimage sights in the Christian world, and to get in touch with my grandmother’s roots as well. So many pilgrims lined up to touch the tomb of the Saint and to deposit notes and photos with their intentions or thanks for answered prayers. I was one of them. It was very moving. I was also moved, of course, by the beauty and majesty of the phenomenal basilica itself, especially the Donatello altar and his bronze equestrian statue outside of the church. I could only get photos outdoors, so check out the web site for more about the church: http://www.basilicadelsanto.org/ing/home.asp The marble reliefs in the Saint’s chapel were beautiful and we had to return the next day for a second look at them, the reliquary chapel, and the frescoes in the Chapel of St. James. 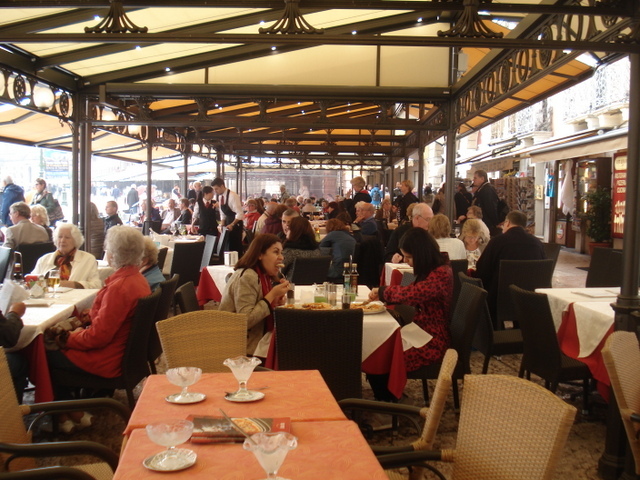 After the Basilica, we decided to walk across town to get a feel for the city, and planned to stop for a drink in one of the many great piazzas—probably Piazza degli Signore. But on our way, we came across the crazy celebrations of newly minted graduates of the University of Padua. 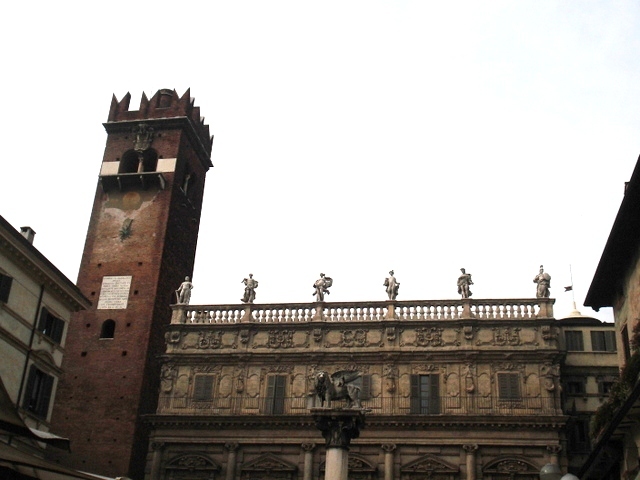 Among all of this religious tradition, the city of Padua has one of the oldest and most progressive universities in the world. As for the craziness–Please check out my earlier post “Dottore, dottore” to see the video—the link has been fixed so you can watch it and hear the song. Graduates wear the traditional laurel wreaths and then add crazy costumes, as they stand in front of their caricature posters and read their friends’ list of “charges.” It’s really entertaining, including the song that is sung over and over by friends and family to each of the grads, all afternoon and well into the night. IN spite of all the Italian swear words, we couldn’t get the little ditty out of our heads the next day! We were in their good company for our cocktails in the piazza. We tried to stop for a drink, a meal, or a coffee in every piazza in Padua during the few days we were there—and I think we may have succeeded! Maybe it’s because it’s a College town, after all, but we just felt so comfortable in Padua from beginning to end. Great Italian food and wine—amazing iconic artworks, why is it we are going to France now? I guess you’ll find out in a few days. This entry was posted in Uncategorized on October 22, 2013 by ayoelkers. 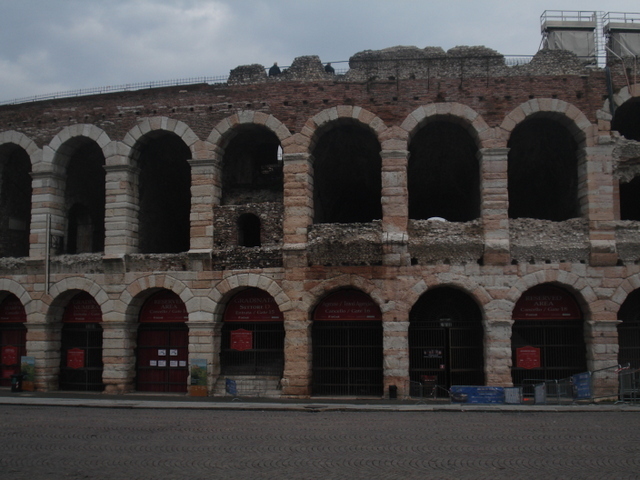 After Venice, we spent a few days in Verona. Unfortunately, some of our time was spent on “housekeeping” issues. Crisis #1 was about getting the laundry done. Our apartment had a washer but no dryer. In the damp and rainy weather, we had a hard time getting everything to dry. So we put our wet clothes on plastic coat hangers and hung them from the chandeliers. An interesting decorating idea—Wish I’d taken a photo to show you. By the way, the apartment was lovely, and in a great location in the old city. Another Italian B&B find. Crisis #2 was my Iphone deciding it would no longer have WIFI access. After spending half the night on live chat with Apple tech support, then half a day in Verona with a “Certified Apple Genius” we realized the board was gone and a new device would not be compatible and I might lose all my data. So now my smart phone is just a dumb phone. No email checking, no aps. Could be worse, as travel crises go. Last night we met people who had their luggage stolen, and others who had their rental car break down in the middle of nowhere. We’ve been pretty lucky so far. Knock wood and keep praying for us!! 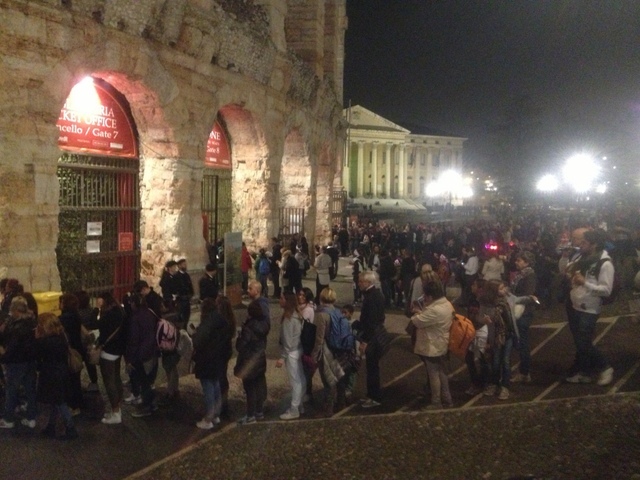 So, how was Verona? 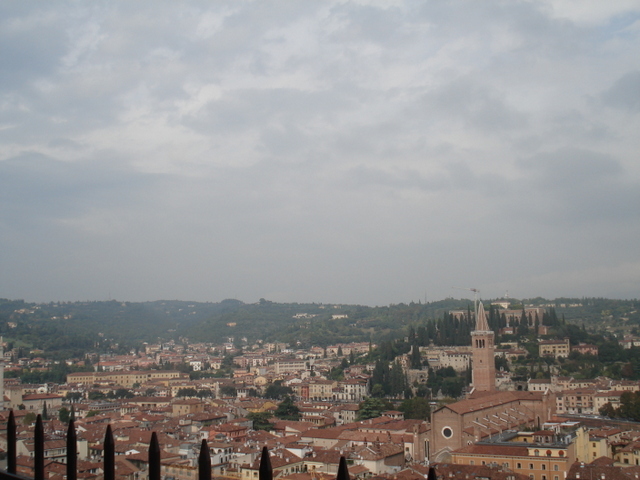 We did all the usual things–climbed yet another bell tower–the tower Lamberti. When I have time I’ll have to put together a slide show of all the views from the tops of bell towers on this trip. We visited the Castelvecchio, the churches, the Scaligeri tombs, and enjoyed people-watching in the Piazza Erbe and Piazza Bra. 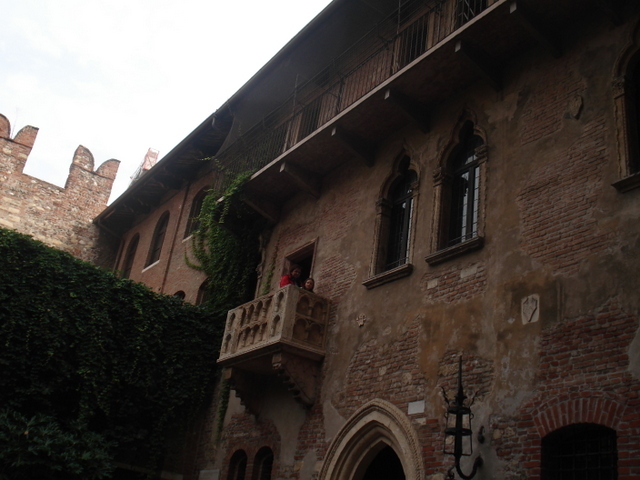 But THE MOST visited place in Verona is “The Home of Juliet.” People from all over the world line up to feel the connection to Juliet Capulet here in Verona. They lock up their hearts with padlocks, leave her love notes, pack themselves into the little courtyard to gaze up at “Juliet’s balcony,” and buy all manner of tacky love trinkets. 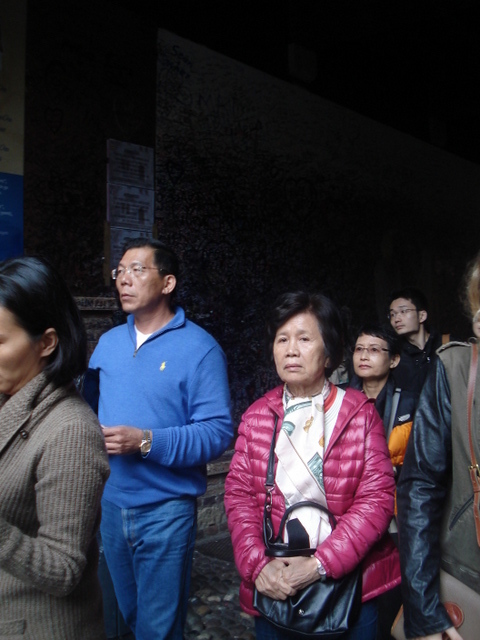 Busloads of tourists show up for this! I’m glad that Shakespeare’s young heroine touched so many hearts, but really, don’t they know that this is a fictional character? They even travel to the outskirts of town to visit “Juliet’s tomb!” Weird and fascinating. 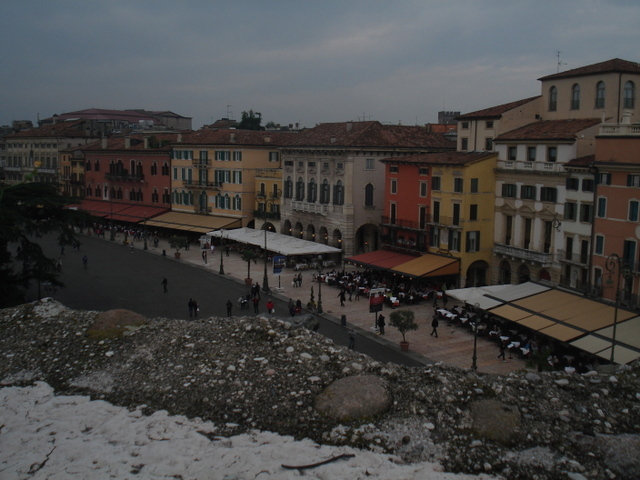 This entry was posted in Uncategorized and tagged https://anitaandray.files.wordpress.com/2013/10/cafe-on-piazza-bra.jpg?w=630 on October 21, 2013 by ayoelkers. We might miss the sound of bells after we leave Europe. This entry was posted in Uncategorized on October 17, 2013 by ayoelkers.